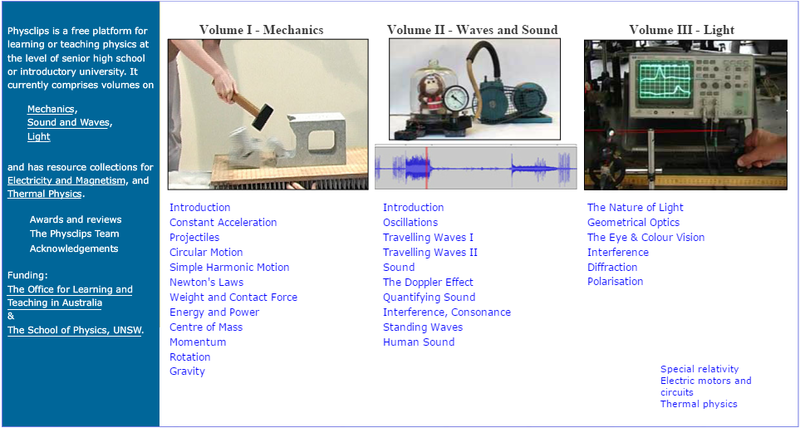 Physics animations and film clips: Physclips. For an audiovisual introduction to understanding the structure and navigation of Physclips see What is Physclips? On Designing educational animations, we list some of the advice given in the literature, and show how some examples from Physclips would appear with and without these principles. Some support pages, together with the audiovisual introduction, have been translated into Chinese and can be accessed here. For some primary school resources, see Glimpses of Science. Support for this project website has been provided by The Australian Office for Learning and Teaching, an initiative of the Department of Industry, Innovation, Science, Research and Tertiary Education. The views expressed in the project do not necessarily reflect the views of The Australian Office for Learning and Teaching. Unless otherwise noted, content on this site is licensed under a Creative Commons Attribution-Noncommercial-No Derivative Works 2.5 Australia License.